Anything from a company to products, websites to blogs require a good name to have a good impression at the audience. Getting a good name for the site can be really difficult as most of the names are already taken by some one else. This case is especially prominent in the area of website’s domain name registration. Its similar to not having an email Id you wanted. Millions of domain names are created daily and deleted daily, so what matters is making sure that you get the names you want before some body else. But how will you do that? 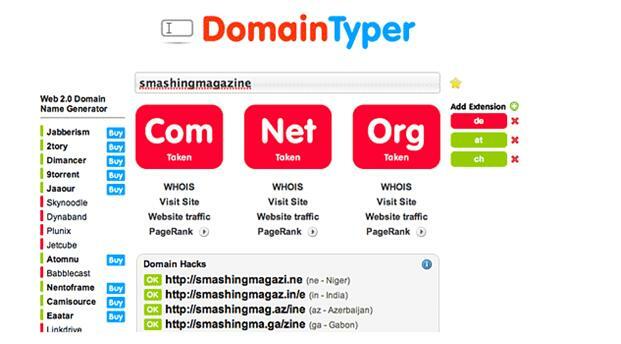 It simply requires a tool that will show you the available domain names over all the domains. Here are the lists of 25+ tools that will allow you to check for the free domain names. GoDaddy is probably the most popular domain registration service in the world. In 2009, it reached more than 36 million domain names under management. It has one of the most comprehensive service from domains to hosting to Site Building. It is one mega platform for buying and selling anything related to web services. 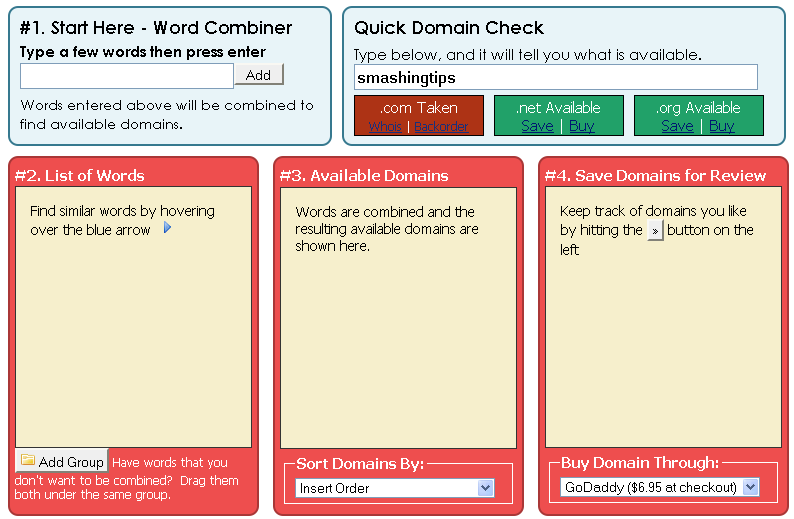 BustaName helps you find available domain names based on the entered keywords. The keywords has to describe the website that you are going to make, and BustaName will bring back all the available domain names using these keywords. You can extend the search by adding synonyms, adding suffixes/prefixes, dropping vowels, etc. Once you get a list of available domain names you can sort them alphabetically, rank by quality and add potential candidates to your watch list. Domainr provides all the different possible domain names it creates. You’ll also see generic domains like .com,.net and .org. If you’re looking for a non-Latin internationalized domain name, you can enter characters with accents or other diacritics, and even scripts such as Arabic, Hebrew, Chinese, Japanese and Hindi. 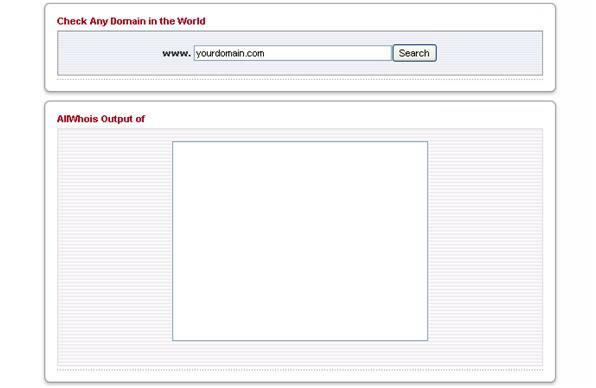 Domainr also shows whether a domain name is possible to register—different domains have their own restrictions for things like minimum domain length, top-level registerability, and International character support. DomainFinder is a simple web application for webmasters which helps you to find fun domain name. This is another application that lets you find domain names. 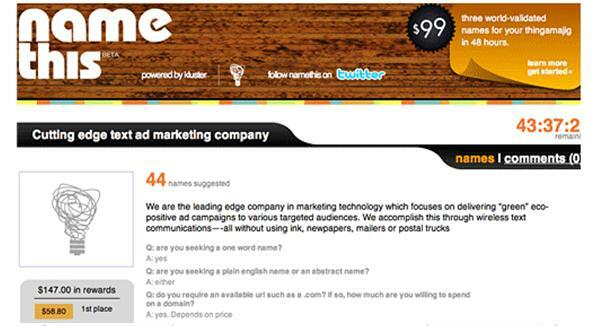 NameBoy, as its “name” suggests, is a domain name generating tool that’s currently making waves all over the ‘net. It doesn’t matter if you’re looking to enter a competitive field such as free poker or something as unique as your whole name, NameBoy can find the available domain name for you. Dot-o-mator gives a domain name suggestions. User has to enter a word or words, and choose some endings (or enter your own), click to combine them. If you see a name you like, you can check its availability or save it to your scratchboard. There is a max of 15 words in the prefix and suffix boxes. This application lets you search for current and expired whois domains and dns tools. In addition to checking whether a domain name has been previously registered or not (the limit of other domain name look-up tools), Domize will check whether unavailable domain names can be bought on the secondary market or whether they’re soon expiring. Most incredibly, Domize runs these additional checks in no time, meaning you’re spending less time waiting for page reloads or starting at spinning icons and more time finding your perfect domain name. 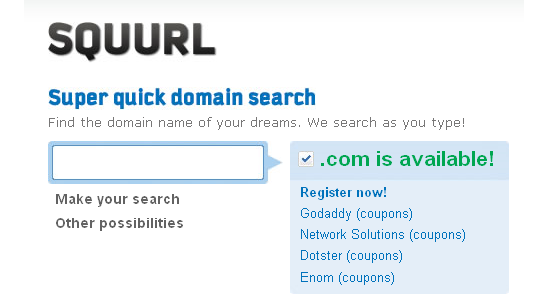 Squurl allows you to quickly and easily check domain name availability. It has a simple interface to add the keywords and search for the free domains available. AW is a comprehensive and easy to use service for finding available domain names and obtaining WHOIS and other information about registered domain names. The first public version was built under the Microsoft .NET platform (C#) and was released to the public on November 17, 2005. Domain Typer is a simple to use search engine that allows you to simply add the desired name for the domain, and you will instantly be notified whether it can be used or not. Moreover, the website includes a dynamic Web 2.0 domain name generator which comes up with random names for you to sift through and see if a memorable one comes about. If that is the case, a link is provided for you to buy it on the spot. DNZoom By Bido consolidates nearly every facet of the domain monetization and management lifecycle into one easy to use application. Buy your domains, track their performance, update Whois information, and sell domains (coming soon!) all with a single, secure login. Domain Pigeon lists available domain and Twitter names which you can register as you please. Allwhois™ automatically locates the appropriate “whois” database server for a particular domain name, queries that database for information about that domain name, and returns all available data. In addition, a domain name availability check will also be performed, even if a particular domain extension doesn’t have a searchable whois database. 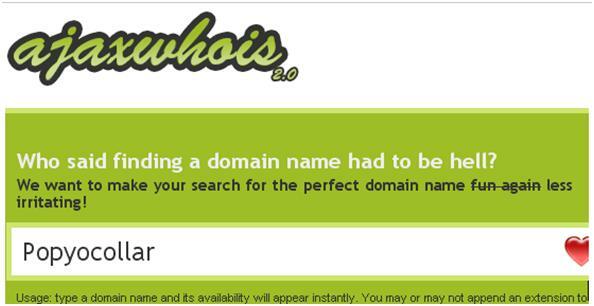 We all know how tiresome and painful finding a domain name can get. You just need to describe the project or product and Namethis will suggest you the name. This $99 service can really save you a lot of time and trouble. 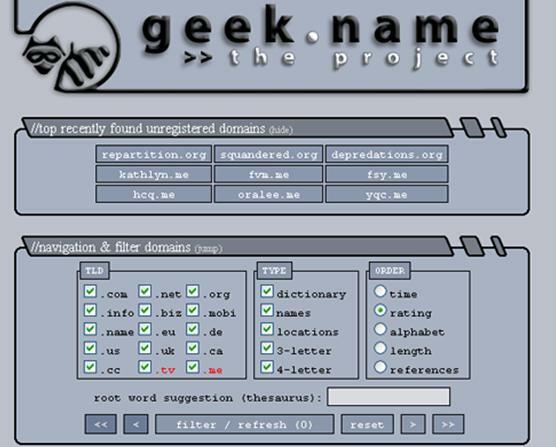 Checkdomain is a simple tool that allows you to search for the domain name by typing in the name along with the appropriate domain, such as .com, .biz, .info, .ws (for businesses), .org (for non-profit organizations), .edu (for educational institutions), .net (for networks), .mil (for military) and .gov (for government agencies). You can also search domain according to countries. 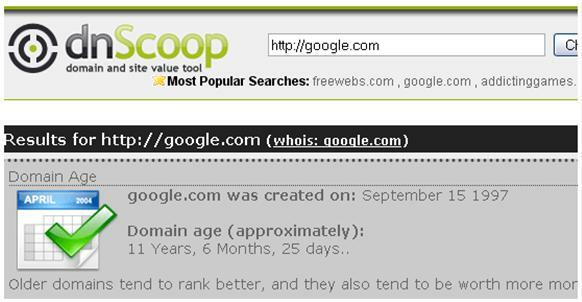 CoolWhois lets you look up the registration information for any domain name including the generic top level domains (.com, .net, .org, .info and .biz) and thecountry top level domains (such as .uk, .de, .to, .ws, .at, etc.). 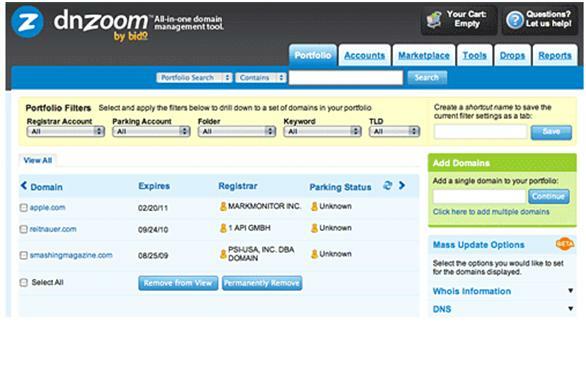 This is a desktop application that lets you manage all the domain’s protfolio. 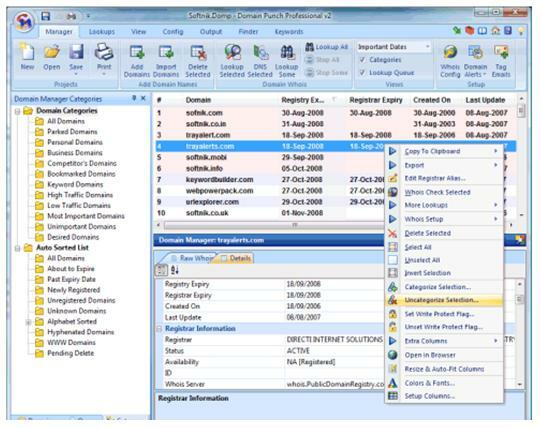 You can research and find good domain names, organize and manage your domain portfolio, watch expiry dates,monitor web sites associated with the domain (including ping and http home page check), get email alerts when the status of a domain changes or if the server fails a ping test, categorize domains into different groups for easy management. Domainer is the domain tracking and managing application built for MAC OS. You can enter domains that you would want to monitor with some additional details. It also shows domain-related data such as Page Rank, the amount of incoming Links, bookmarks on Delicious and Digg stories to a particular domain. Other useful features are syncing renewal dates with iCal, Smart Groups for organizing and import / export of lists. Sort Domains by Expire Date, by Registrar, by Genre and by IP address. You can also filter the list just to show certain domains – like ones starting with pe.. It provides a complete platform to manage all your domain chores. This is an interesting application that allows you to register domains through twitter. 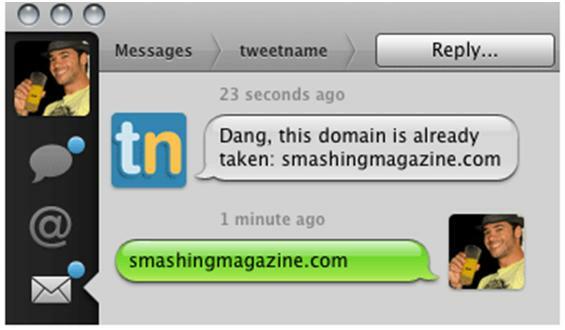 Tweetname can automatically send a tweet from you when you successfully register a new domain name. iWantMyName is a domain registration and management service for international domain names. iWantMyName also makes it easy to connect domains to popular web services and applications. I hope that this collection will help newbies who are planning to give their website a brand name. Wonderfull informations. Your site is one of the few that offer good info on domain names. Thanks alot. Another domain name generator is http://www.dombuddy.com. It’s a free online generator that comes with a Mac/Win desktop client. Also see http://www.namestation.com for domain name ideas. It is a domain name generator that uses a variety of methofs to come up with available domains – keyword lists, dictionary domains, fast bulk search. wow your art work is so awesome!!!!!! Thank you for the great post. http://www.namestall.com/ is relatively a new domain tool website. 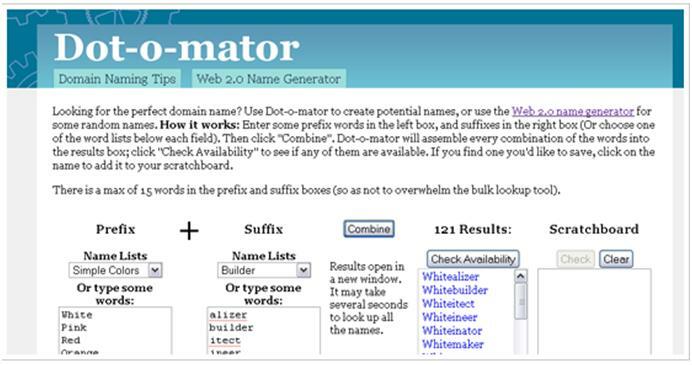 but has some very advanced and intelligent domain name generator, domain name suggestions, instant domain search, brandable domain generator plus 10 more domain tools. You can also try or list this website. A very useful website with useful tools. If you visit the site you will like some tools for sure. Once again thank you very much for the great article. It will more useful to share domain monitor tools rather than are domain name generator tools.